Built in 1870 in an eclectic vernacular style to replace the original 1825 stone church and schoolhouse, the Highlands Presbyterian Church has undergone a massive restoration in 2011-2012. The active and friendly congregation provides for the spiritual needs of the area as well as participating in and providing space for many community activities. Originally built to serve the needs of all Christian,19th-century, hotel patrons, the church served without a permanent minister and was founded as the Schooley's Mountain Union Evangelical Church. The Rev. Spencer H. Cone, D.D. a well-known Baptist Minister, summered in Schooley's Mountain Springs and frequently preached at the small stone church. He, his wife and one child are buried in the cemetery in Pleasant Grove. 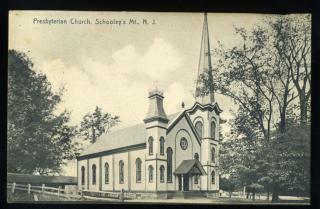 The church became associated exclusively with the Presbyterian Church in 1874 after the Rev. Samuel Sawyer's successful revival.